CALGARY, ALBERTA, April 03, 2018 – Lithium Chile Inc. (“Lithium Chile” or the “Company”) is pleased to announce that it has identified multiple 20 – 25+ square kilometre (km2) brine target areas at both its Atacama and Ollague lithium projects in Chile, where near-surface brine values of up to 1330 mg/L lithium and 1140 mg/L lithium, respectively, have been discovered. These open-ended, low resistivity zones were identified by Transient Electromagnetic Surveys (TEM) within the northwest trending axis of a sub-basin on the northeast flank of the Salar de Atacama and the southwest arm of Salar Ollague. Importantly, these areas display the same geophysical characteristics as the lithium-rich aquifers at Salar de Atacama, home to the world’s largest and highest-grade lithium brine producers. Drilling is expected to commence April, 2018. 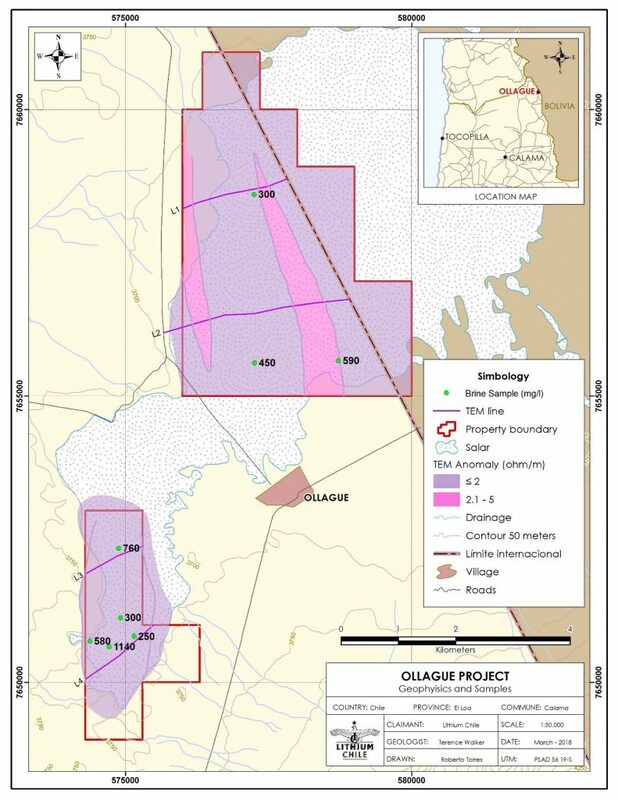 High-Priority Targets: Large multiple 20-25+ km2 lithium brine target areas identified at Salar de Atacama property and Salar Ollague property. Imminent Drilling: Drill program to commence in April 2018, focusing on high-priority target areas. 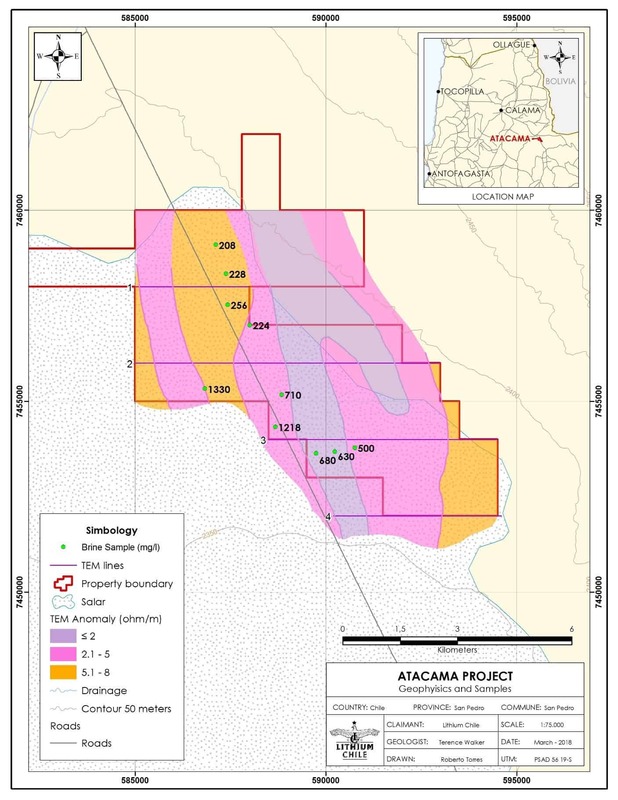 Project Size and Grades: Atacama Property covers 6,600 hectares of the NE flank of Salar de Atacama and contains near-surface Li brine values up to 1330 mg/L lithium. Ollague Property covers 2,200 hectares of the SW arm of Salar Ollague and contains near-surface Li brine values up to 1140 mg/L lithium. Excellent Chemistry: near surface brines on both properties have excellent chemistry including an Li:K ratio of 0.9-0.1 and an Mg:Li ratio of 2.6-7.1. Close to Infrastructure: Located within the Salar de Atacama and the Andean Lithium Belt, both properties are accessible year-round via a paved highway from the towns of San Pedro de Atacama and Calama. 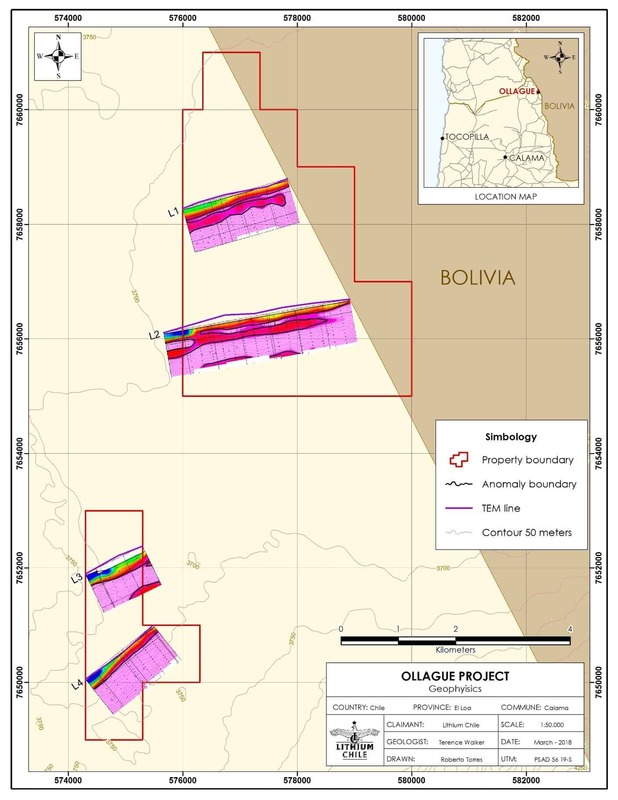 These recently completed geophysical surveys indicate several open ended horizontal zones varying from 50 to 75+ metres (m) in thickness at Atacama and 20 to 200+ m in thickness at Ollague and within 20 to 120 metres of surface. The Company believes the zones reflect saline aquifers (resistivity values of generally less than 3 ohms). Lithium Chile Inc. is advancing a lithium property portfolio consisting of 148,500 hectares covering sections of 13 salars and 1 laguna complex in Chile. The properties include 66 square kilometres on the Salar de Atacama which hosts the world’s highest concentration lithium brine production and is currently the source of about 30% of the world’s lithium production. Lithium Chile also owns a significant Copper/Gold/Silver property portfolio consisting of 28,184 hectares over 6 different properties located in Chile. Lithium Chile Inc.’s common shares are listed on the TSX-V under the symbol “LITH”. To find out more about Lithium Chile Inc., please contact Steven Cochrane, President and CEO or Jeremy Ross, VP Business Development, at (604) 537-7556 or via email to: info@lithiumchile.ca. This news release may contain certain forward-looking information and forward-looking statements within the meaning of applicable securities legislation (collectively “forward-looking statements“). Generally, forward-looking information can be identified by the use of forward-looking terminology such as “expects”, “believes”, “aims to”, “plans to” or “intends to” or variations of such words and phrases or statements that certain actions, events or results “will” occur. In particular, this news release contains forward-looking statements relating to, among other things, management of the Company’s views regarding its properties and the ability of the Company to conduct exploration on its properties, the anticipated drilling program of the Company and the proposed Spin-Out Transaction.